When making meals the HumanaNatura way and using HumanaNatura’s OurPlate guidelines, a nice variation is to use two or more protein foods in combination, instead of just one. It’s a great way to add variety to your meals and create interesting new tastes. But which proteins should you combine? Really, the question should be, what proteins do you have in your refrigerator? In practice, thinking of proteins that do not combine well is much harder than thinking of ones that do. This mixed-protein meal was made in less than 10 minutes and is extra-tasty. It starts with a stir-fry of diced pork, ground turkey, and chopped red onion, which is seasoned with black pepper, garlic bits, and turmeric just before cooking. Once cooked, the proteins are allowed to cool for a couple of minutes. Some sliced grape tomatoes and diced celery are added, as is a generous amount of tarragon. This protein and veggie combination is then paired with a half-plate of fresh arugula, sliced orange wedges, and a few blueberries. It’s all garnished with parsley, paprika, lemon, and black pepper. A delicious double-shot of protein that makes for a healthy and satisfying meal anytime! Learn more about creating naturally delicious and optimally nutritious meals through OurPlate, HumanaNatura’s simple optimal eating guide and meal rating tool, and experience how this science-based and 100% natural approach to daily meals can change the way you eat, feel, and live. Perfect your skills at making delicious and naturally healthy salad meals that follow the OurPlate guidelines via the Meals tab above, our popular article Perfect Salad Meals, or the Natural Eating section of our comprehensive Personal Health Program. Once you have begun eating the HumanaNatura way, you can explore your many opportunities for new, more natural, and healthier life between meals – via HumanaNatura’s complete and naturally open-ended system for lifelong and lifewide health and fitness. Check out an overview of our health programs at The Four HumanaNatura Techniques. Tell others about HumanaNatura…create new life and health! We often think that exercise takes time. In practice, however, this common assumption proves self-reinforcing but untrue. As people who exercise regularly know, physical conditioning is essential for vibrant and engaged life. For this reason, exercise actually or naturally makes time in our lives. The persistence of the idea that exercise is time-consuming owes in part to the fact that we often see exercise as activity apart from the rest of our modern lives. Notably, this perspective is born from life that often unnaturally involves long periods of inactivity and sitting each day – in cars, trains, offices, homes, restaurants, and theaters. Related to this is a modern outlook that fails to see physical activity in general as exercise, as a ready means to ensure natural conditioning – an essential natural health enabler and key HumanaNatura goal. So we sit and think about the modern challenge of exercise, instead of walking and naturally having this exercise as a daily part of our lives. As a consequence of both outlooks – and the reduced natural health and functioning that inactivity inevitably causes in us – many of us are unnaturally inactive for many hours each day. In this compounding process, our reduced natural activity lowers our capacity for and interest in physical activity, creating an ever-widening gulf between our lives and our potential for vibrant natural health and fitness. In this now common pattern of life, we fail to see our many opportunities for and the urgent benefits of a more naturally active and energetic life, instead lamenting our seeming lack of time, opportunity, and energy for exercise and naturally active living. Hearty & Healthy Salad Meal! Meals made the HumanaNatura way and using HumanaNatura’s OurPlate guidelines are always healthy, and they can be made hearty too when you feel the need for a filling or lasting meal. To do this, simply use a more filling protein, and combine it with a generous amount of raw vegetables and enough fruit to make the meal piquant and slightly adventurous. Today’s meal inspiration shows this idea in action. It uses a tuna fillet, which is now available at a very low-cost in many markets via flash-freezing technology. Though tuna is a fish from high in the marine food chain and, like red meats, should be a somewhat limited part of our total diet, it is a delicious and still healthy break from a dominant pattern of protein foods favoring non-red animal meats and fish from lower in the food chain. This rich and delicious meal was made in less than 15 minutes and at a cost that rivals fast food. It starts with a broiled tuna fillet with diced red onion and carrot, garlic bits, turmeric, parsley, and red and black pepper. While this hearty protein is cooking, a veggie base and mix are prepared with fresh arugula, diced cucumber, halved grape tomatoes, and orange wedges. We then add our cooked protein to the side and it’s all garnished with pistachios, parsley, lemon, coriander, and black pepper. Delicious, satisfying, and easy to prepare…yes, you can have hearty and healthy too! Into The Blue Salad Meal! Meals made the HumanaNatura way and using HumanaNatura’s OurPlate guidelines are always healthy. But taking the extra steps of using fish as the protein, and using fish from lower in the marine food chain, can make our modern natural meals perfect. In principle, fish is the healthiest form of protein available to us – even more so when large fish (and their frequent accumulated metals and toxins) are avoided. In practice, going “into the blue” for our protein in this way is simply delicious, as today’s HumanaNatura impressive salad meal demonstrates. This extra-healthy and great-just-to-look-at salad meal took about ten minutes to prepare. We began with a sauté of fresh sole lightly cooked with red onion, chopped carrot, garlic bits, turmeric, and black pepper. This protein then is paired with fresh arugula, diced cucumber, halved grape tomatoes, and a few blueberries. Just before serving, it’s all garnished with pistachios, parsley, lemon, coriander, and black pepper. Go into the blue today if you can…with fresh fish, a few blueberries, and of course a blue plate to match! Welcome to HumanaNatura’s HN-100 Natural Fitness Program! If you want to quickly achieve remarkable new natural fitness and lay the foundation for lifelong progressive health and well-being, the HN-100 Natural Fitness Program was created for you. HN-100 was designed by HumanaNatura to help adults of all ages steadily and naturally remake their health, fitness, and quality of life through a structured, focused, and easy-to-follow daily fitness plan. With HN-100, HumanaNatura introduces and guides your initial use of all four of our transforming natural health techniques, and allows you to reliably and progressively improve the level of natural health, fitness, and vitality you enjoy each day. 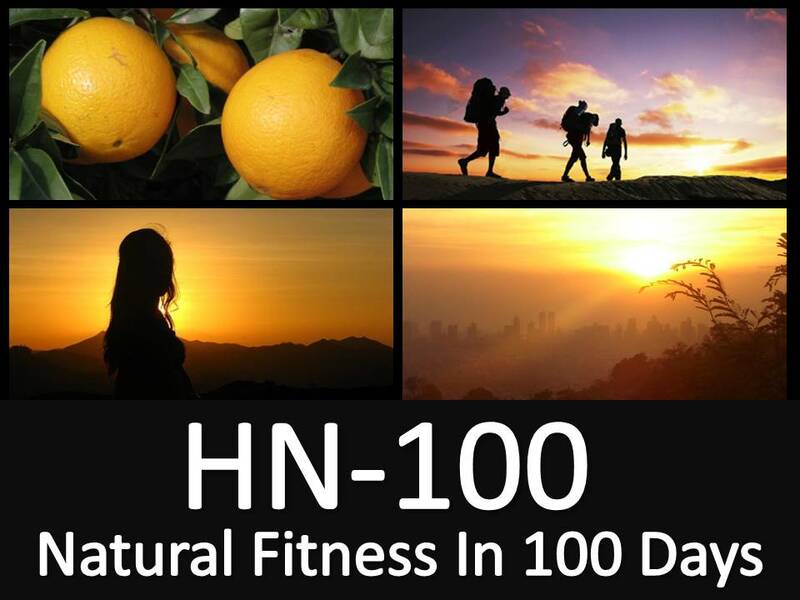 As its name implies, HN-100 is an intensive 100-day health and fitness program. It is also a 100% science-based and natural program, and is 100% free for your personal use. HN-100 is intended as a superior, more natural, and more complete alternative to costly and more narrowly focused commercial diet and fitness programs, including P90X and many others. With HN-100, you will spend about an hour a day in health and fitness promotion activities. This will set the stage for a sustained health commitment at this level throughout your life, while allowing you to experience firsthand the often startling benefits of HumanaNatura’s comprehensive, progressive, and engaging approach to personal health and fitness. It’s hardly a sacrifice eating the HumanaNatura way and using HumanaNatura’s OurPlate guidelines. In fact, with HumanaNatura, you can spoil yourself healthy, everyday and at every meal. All it takes is an understanding of the key principles and practices of modern natural living and a bit of creative flair. This delicious-just-to-look at HumanaNatura “salad meal” begins with a ginger, red pepper, and turmeric rubbed halibut fillet, which is pan-cooked with thin-sliced red onion, broccoli bits, and a handful of shrimp. This protein and veggie mix is then served on a generous mound of fresh arugula along with julienne cucumber, quartered grape tomatoes, and a few blueberries. A naturally healthy indulgence that needs little else, it’s garnished with a scattering of pistachios, parsley, lemon, coriander, and black pepper before serving. Good…no, great! Learn more about creating naturally delicious and optimally nutritious meals through OurPlate, HumanaNatura’s simple healthy eating guide and meal rating tool, and experience how this science-based and 100% natural approach to daily meals can change the way you eat, feel, and live. Perfect your skills at making delicious and naturally healthy salad meals that follow the OurPlate guidelines via the Meals tab above, our popular article Perfect Salad Meals, or the Natural Eating section of our comprehensive Personal Health Program.